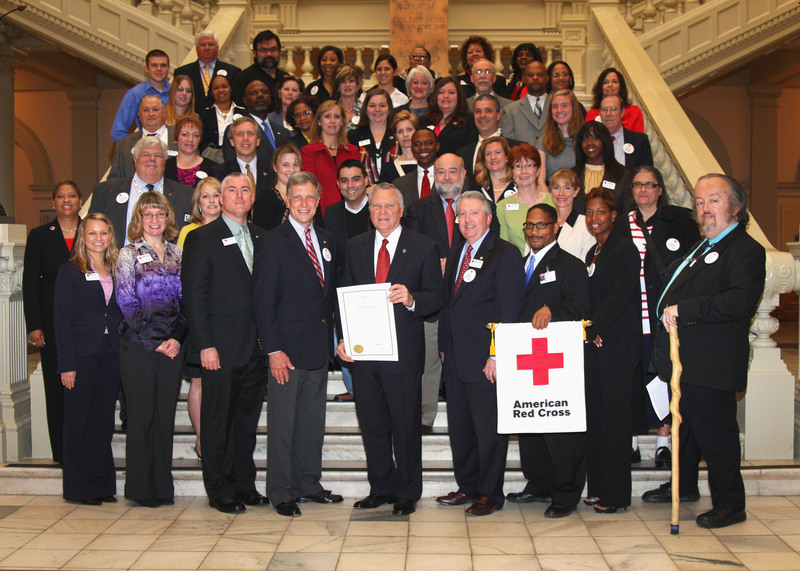 In celebration of what Georgia’s Red Cross has done for the state this past year, and as part of a greater celebration of Red Cross Month, governor Nathan Deal proclaimed March 16, 2011 as Red Cross Day. Forty-Seven volunteers and employees from nine Red Cross community chapters across the state joined us at the “Gold Dome” to meet with the governor, speak with GEMA director Charley English, listen to state representative Pat Gardner read a resolution honoring Red Crossers, and talk to their individual state legislators about the Red Cross’s humanitarian effort within their respective districts. We arrived in the morning to a hectic scene at the Capitol as Red Cross Day happened to fall on Crossover day (the second most important day in Georgia’s state legislative session). 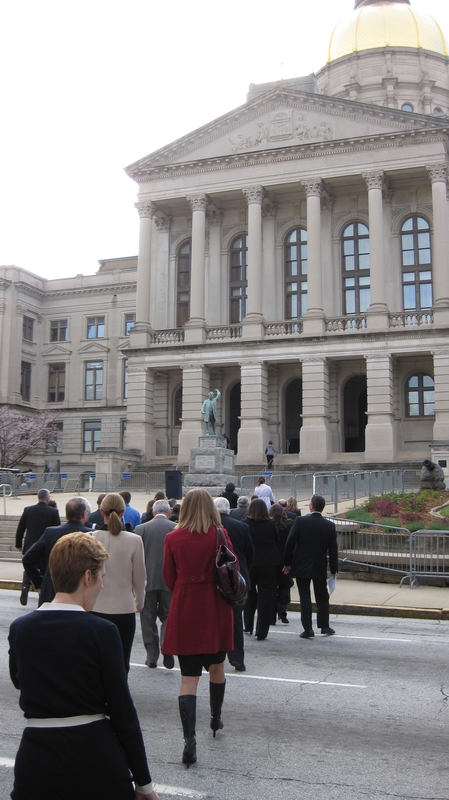 Lobbyists were peppered across the grounds while state representatives and senators speed-walked from one corner of the building to the next all hoping to get a jump on the next vote. 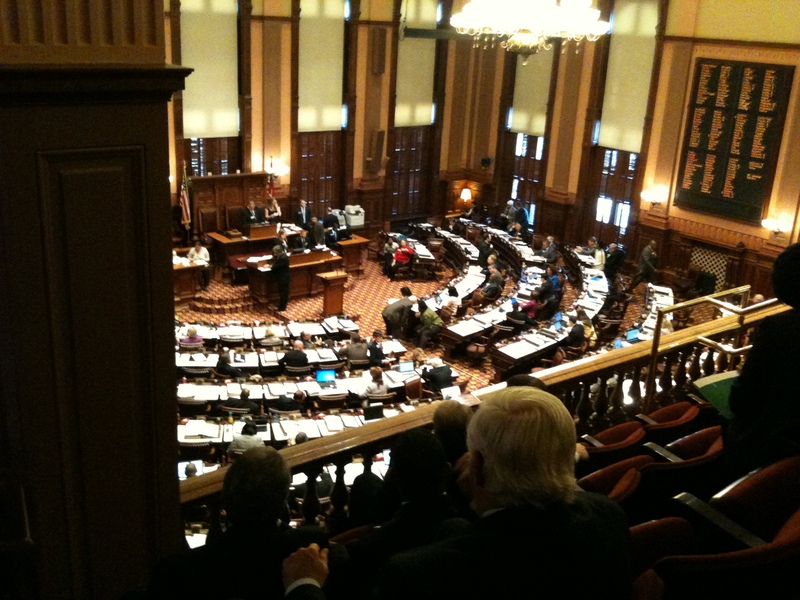 Even in the midst of such an important legislative day, the Red Cross had an unmistakable presence at the Gold Dome. Not only were there nearly 50 of us in a heard proudly wearing our “+” buttons, but the Red Cross set up tables to spread our humanitarian message and even provided a venue where elected officials and passersby could donate blood. After a few kinds words with GEMA director Charley English, we were ushered into the House chambers. Representative Pat Gardner recognized our efforts with a house resolution and the entire chamber rose to a standing ovation. Mary Beth McLeod, from the Savannah chapter, looks determined to meet with her legislator. Ruben and I are lucky enough to work just minutes away from the Capitol, but you could feel the excitement by members of local Georgia chapters upon entering the Dome and see the smiles on their faces knowing that their efforts have not gone unnoticed in this state. 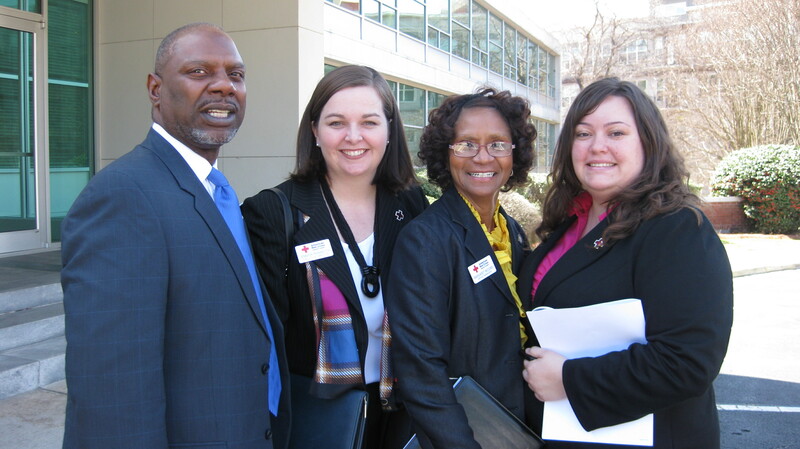 By now you should know that Red Cross Day at the Capitol was a huge success! While we realize that our volunteers and employees don’t need the special recognition to be satisfied in doing the selfless work that they do, it’s always important to recognize those whose actions truly reap benefits. Red Crossers from Augusta pose as the day winds down, "We're the Augusta Chapter". "He won't remember, anyway." Well I did remember guys. And thanks so much for coming! This entry was posted in Photos, Uncategorized, Volunteers. Bookmark the permalink.